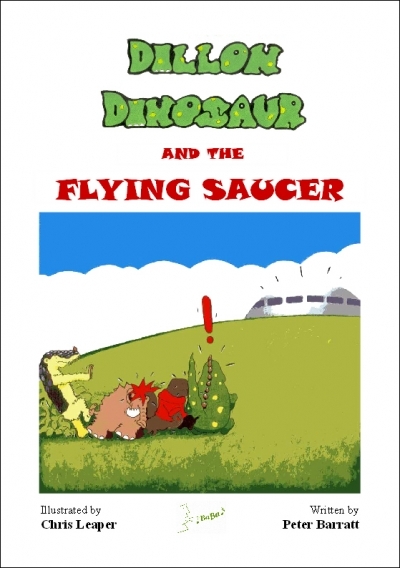 When Dillon and his friends are running into the Park to get to the swings quickly they are shocked to see a flying saucer and to their horror, the Park Keeper coming out of it. Their day of chaos has just begun. The moral of the story is 'Look before you leap' or to put it another way 'Make sure that you know what's going on or what something is, before you say, or do, anything. You can end up looking very silly if you don't. (A5 size, 148 x 210 mm). Our Picture Books each have a cover of four pages, the two outer pages of which, 1 & 4, are gloss laminated for long lasting protection. The coloured front cover is shown opposite. A Picture Book can have 12 or 16 inner pages, which have a silk finish, containing colour illustrations and about 750 words. The price per book is £3.00 plus (in the UK) a £1.30 contribution towards our costs of postage and packing for up to any 8 Picture Books. This contribution to our costs of postage and packing increases if you (a) want more than 8 Picture Books (b), include one or more Colouring Books or any other of our products with the Picture Books (c) want your purchases delivered to an address outside of the UK. Details of the modest postage and handling charge will be stated in our shop area when you provide details of the address to which you want the parcel delivered. If you wish to purchase a copy of the paperback version of this Picture Book please click the 'add to order' button below and it will be added to your shopping basket. You will then have the opportunity to add further copies to your order, or to continue shopping, or to go to our shop area check out where you will be asked to provide the information we need. We are sorry that because of a change in the rules governing the supply of digital services, which includes our e-books, across the European Community we have had to suspend the facility we normally provide for you to digitally download copies of our Dillon Dinosaur picture books and colouring books. The facility will be restored if the rules are simplified at some time in the future.